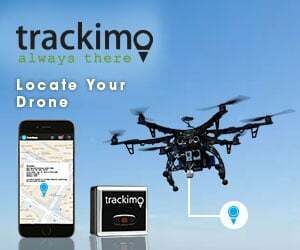 The following blog post is a guest piece from Chris Anderson, the creator of the site The Drone Trainer. Modern drones often come with the possibility to capture mind-boggling images at several different exposures, and create stunning HDR (High Dynamic Range) photos. But with that comes an onslaught of HDR photos that are far overdone — and basically burn your eyes. Here’s your guide on how to create natural looking HDR photos with your drone, using AEB (Automatic Exposure Bracketing). When shooting in AEB mode, your drone’s camera will automatically take three or five shots, each at a different exposure level. On their own, these individual photos are going to be under- and over-exposed. That’s okay though; once you merge them together, you’re going to have a thing of beauty! These photos were captured by setting my DJI Phantom 4 Pro to shoot in AEB 5 mode. To adjust this, simply go into your camera settings (right side of your screen below the shutter button), and in photo mode select AEB. You’ll be able to choose 3 or 5 once in AEB mode, depending on the scene that you’re looking to shoot. I find that for scenes that are well lit, AEB 5 works well as all 5 of the photos will capture sharp detail. As you can see with the above photos, the first one starts off overexposed, while still providing detail in the dark areas (shadows), progressing to the last one that is underexposed but providing details in the light areas (highlights). Each one of these photos technically could be used, however we want to merge them together into a balanced HDR photo. Want to follow along with these exact photos? Simply fill in your name and email and I’ll instantly send you the photos via email. I’m using Adobe Lightroom for this example, but you can use any other similar software to process your HDR photos. In this example I took 3 different photos, all shot at AEB 5, giving me 15 individual photographs. Before we go any further, I’m going to show you a shortcut that will save you a lot of time down the road when you start shooting everything in AEB. What we want to do is work with these photos in “stacks” rather than as individual photos. What Lightroom is going to do now is try and stack all your similar images together, based on the capture time. The next window that opens up will allow you to select the amount of time between each stack, essentially how many minutes or seconds it took you to shoot the 5 AEB photos. You can move the slider around, until you see the number of stacks that you’re expecting. In this example I took 3 photos, so seeing “3 stacks, 0 unstacked” in the bottom left corner of this window is exactly what I’m looking for. In this example, it happened to work out at 5 seconds. If you set your time between stacks too low, you’ll see an unexpected number in the bottom left corner like the following two examples. Once you find the right balance of stacks (stack number must equal the number of AEB photos you took), then click on “Stack” to create them. Once you’ve created your stacks, you’ll see a small number appear in the first photo of each stack, in this case 5. The stacks are still expanded, so we’ll collapse them in order to remove any confusion as to which photo belongs to which stack. Right click on one of them, choose “Stacking” -> “Collapse All Stacks” to collapse the photos down into their individual stacks. Once collapsed, you’re going to see just three stacks, containing all the individual photos. 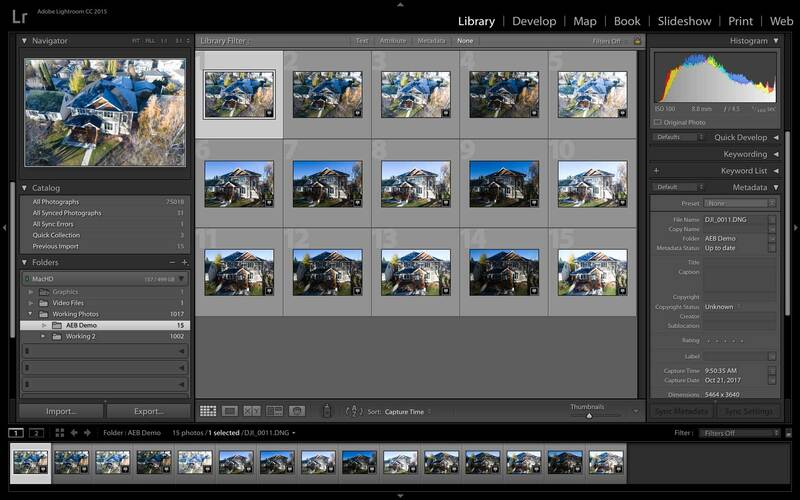 By working in stacks, you’re not going to run the possibility of selecting the wrong photos when you start your HDR merge, and you’re going to save a pile of time when you start working with multiple images. I’ll get to the time saver in a moment. Select and right click on one of the stacks, and navigate to “Photo Merge” -> “HDR” or CTRL+H if you prefer using your keyboard. 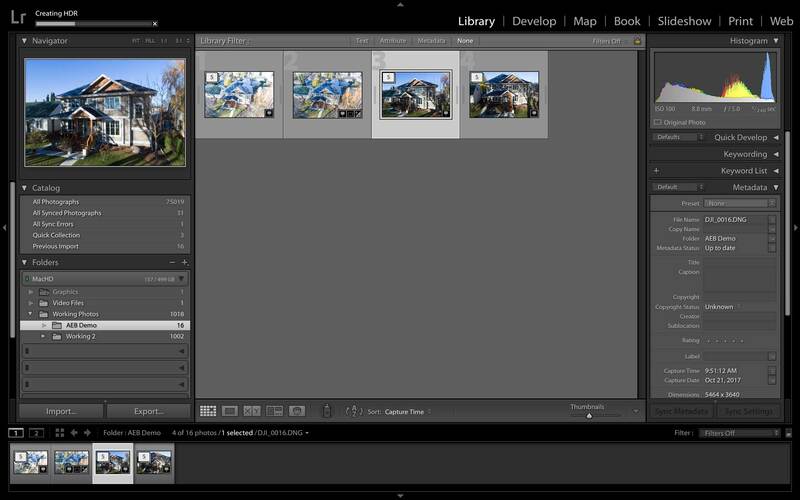 Lightroom will automatically create a preview of your HDR merge, and will give you a couple of options to tweak the photo. I’ve found that Lightroom does a great job at “Auto Align” and “Auto Tone” so I always have those two selected. Deghosting can be a useful tool for scenes where there may have been a lot of movement, but for stationary objects such as this house, a deghost setting of “none” works perfectly fine. If you have a lot of tree movement, or maybe a car or bird went through your scene, you can move between low to high in attempt to isolate that movement, but for this example it’s unnecessary. Once you’re happy with the preview, click on “Merge” in the bottom right corner and let Lightroom work it’s magic! Now that we’ve created our first HDR image and are happy with the results, we can start to batch process the remaining stacks, rather than going through them one by one! Say you have 10 stacks to process; that’s a painstakingly long process to create a preview and then merge them one by one. With this simple trick you can get them all done in the background while you work on other tasks. Simply click on the next stack, and then instead CTRL+H, press SHIFT+CTRL+H and it will process the HDR merge based on your last settings. As Lightroom processes the HDR, you can click and repeat on the subsequent stacks and have Lightroom do them all in the background for you rather than one by one. In this example of only 3 images it might not seem like too much of a time saver, but once you start shooting everything in AEB and have dozens of photos to work though, you’re going to thank me. After you’ve completed your HDR merges, you’ll see your newly created HDR photo show up beside your stack. As you can see, HDR photography with your drone can yield some amazing results. Don’t get stuck just taking single photos, when you can use AEB to capture 3 or 5 photos, and stitch them together into something much more appealing! Now get out there and shoot some AEB photos with your drone, as we’d love to see what you create! With a background in aviation and photography, Chris Anderson was easily drawn to the drone world and has been running a successful commercial drone business ever since. As a commercial drone pioneer, Chris has also successfully trained over 700 students globally via his training site, The Drone Trainer. Follow The Drone Trainer on Instagram, Facebook and Twitter. I know this is an old post – but hopefully you’ll see and respond. With my Phantom 3 Pro I initially tried to use AEB, but ultimately gave up on it as I wanted wider range in my bracket (1.0 stop increments) and two other problems. 1- If shooting RAW+JPG as I usually do, it took about 16seconds to shoot & write to the card. Way too long if I’m doing multi frame panos – and I do a lot. 2- In low light conditions – Pre-dawn, dusk or twilight – the brackets started bracketing the ISO instead of the shutter speed. Totally unacceptable. As I try to stay at 100 iso for everything to keep the noise down & get most dynamic range. So I gave up on AEB. I can do it myself faster manually shooting 1 frame, wait to write to card, then move my shutter speed up or down a stop, shoot, etc. Now with my P4P v2, I’ve not even tried the AEB. Just not in the habit. Do you know of a way to keep the AEB to adjusting the Shutter only – not change the iso??? I’d use it sometimes if that was possible.